The University has created a new Student Services Centre, opening Easter 2019 on the New Museums site, to bring together student serving Units for the first time in the history of the University. Approximately 250 staff members will co-locate with the aim to provide efficient and centralised frontline support to students, and to enhance collaborative work and knowledge sharing between the Units. The tiles below will take you to the websites of each Unit in the SSC. Building core hours will be 8.30-17.30 M-F, although individual Units may operate outside of these hours; check each site for details. Each Unit will be locating to the new building from 26 March ahead of the formal Easter opening of the Centre, so during March and April 2019 it is vital to ensure that you check the correct location for a visit to one of our Units. 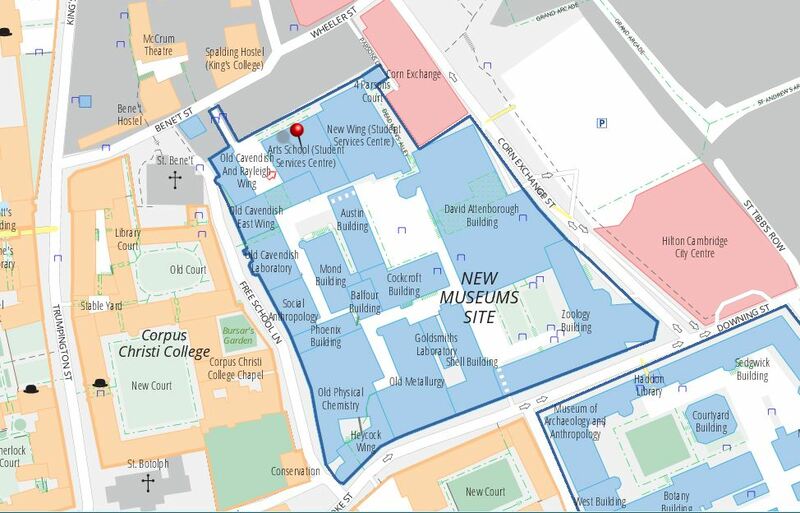 The new Student Services Centre is located at: Bene't Street, New Museums Site, CB2 3PT. Note that the entrance from Bene't St will not be operational at the time of the building opening; please access the building via the archway on Downing/Pembroke Street (next to the Zoology Building and the Shell Building) in the first instance. You can contact the main reception on 01223-764-661. The Careers Service helps you to prepare for your future, supporting you during your studies and beyond. The Student Operations team comprises three main sections: the International Students Office, the Office of Student Complaints, Conduct and Appeals, and the Student Registry. The Disability Resource Centre provides support, advice and guidance to current and prospective disabled students. The University Counselling Service offers a wide range of free confidential help and support: ranging from self-help resources, courses, mindfulness, workshops and groups, to consultations with a counsellor, CBT therapist, Mental Health Advisor or Sexual Assault & Harassment Advisor. The Education Quality and Policy Office manages quality assurance, enhancement of teaching and learning, and matters of student health and wellbeing. The Centre for Teaching and Learning works with staff to enrich educational practice and is a focus for enhancement initiatives and innovation. The Cambridge Trust provides the largest number of scholarships for international students at Cambridge, working with partners worldwide to support students of outstanding academic merit. The Cambridge Admissions Office is the central processing point for applications and admissions to undergraduate and postgraduate degrees. Find out more about the ongoing building work for the Student Services Centre.